Whether we are traveling internationally or domestically we love to explore new places. We hardly ever go back to the same destination as there is just so many new places to see and experience. However, there are a handful of places that just keep drawing us back in. For instance, we love every visit to New York and the America Southwest. Domestically, we visit Niagara Falls at least once a year. But our go-to summer family destination is always exploring what to do in Sauble Beach Ontario, Canada. Check out our video for all the action. Subscribe to see all our latest videos! Most people in Ontario look to Wasaga Beach as their go-to getaway. But just an hour north, on the shores of Lake Huron in Bruce County, the crowds and noise disappear and all that is left is beautiful sand and relaxing waves. 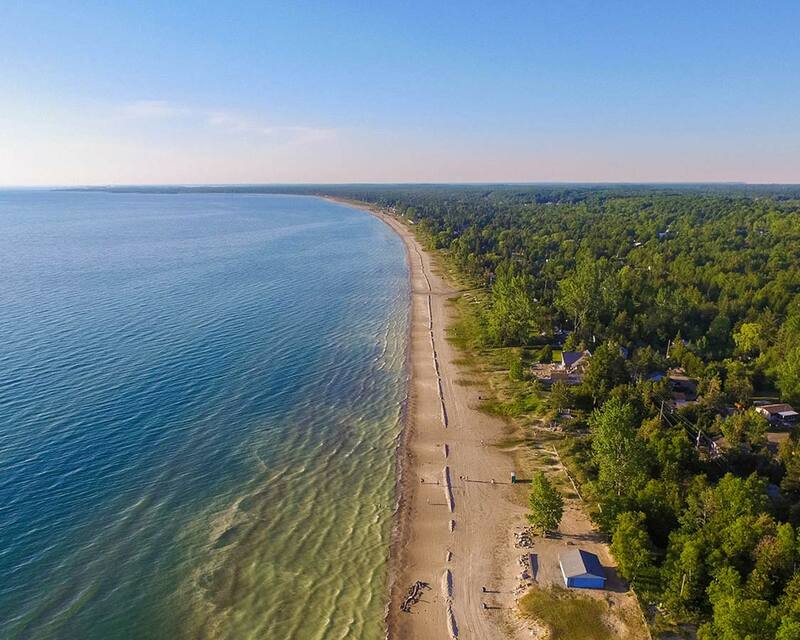 Sauble Beach is the second longest freshwater beach in the world at just over 11 km long. The title for 1st is held by Wasaga Beach. It is also known as Retro beach as it has been retrofitted to match the decor it once had during the 1950’s. Sauble Beach is a public beach made up of a combination of native land (Saugeen First Nations), private land, and municipal land. This means although it is free to use the beach, you must pay for parking during summer season (June – August). The beach is a 230 km drive from Toronto. During off-peak times, we can get from the city to the beach in about 3 hours. However, during the busy summer weekends, the highways heading north can be very busy so you will need to plan accordingly. What we love most about Sauble beach is that even though the secret is out and a lot of people know about this awesome beach, the large size means it is still possible to find your own spot to relax. As you enter via the sign off of Main St., you can turn left to enjoy the beach on the land of the Saugeen First Nations or turn right for the municipal portion. Whichever we choose, the boys spend hours building sand castles using the golden powder. And everybody enjoys swimming in the crystal clear blue waters. 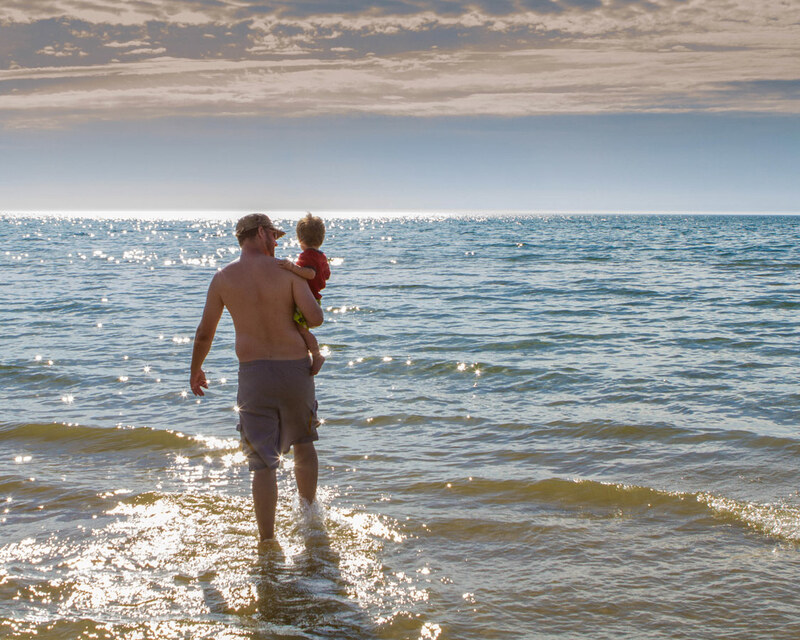 The shallow shores of Lake Huron mean that the children can walk and splash around quite far into the waters, about 12 m actually before it gets very deep. And for the first time last year, D even tried to go out on his boogie board. Pro-Tip: Bring along a baby sun tent to help give the kids some shade from the hot sun. From the beach, we always make the walk into the town. During the off-season, the town has a population of around 2000 locals. But come summer, the numbers easily reach 60,000 people, especially on long weekends. If you are looking for what to do in Sauble Beach Ontario, heading into town is the perfect place to start. Sauble beach town retains the vibe of small-town Ontario, Canada. For those that want to go shopping, there are loads of fun shops and arcades to pick up typical beach fare, cottage items, and other trinkets at reasonable prices. There are fantastic antique and vintage clothing stores, and you can also rent kayaks, paddleboards, boogie boards and other gear not far from the beach. 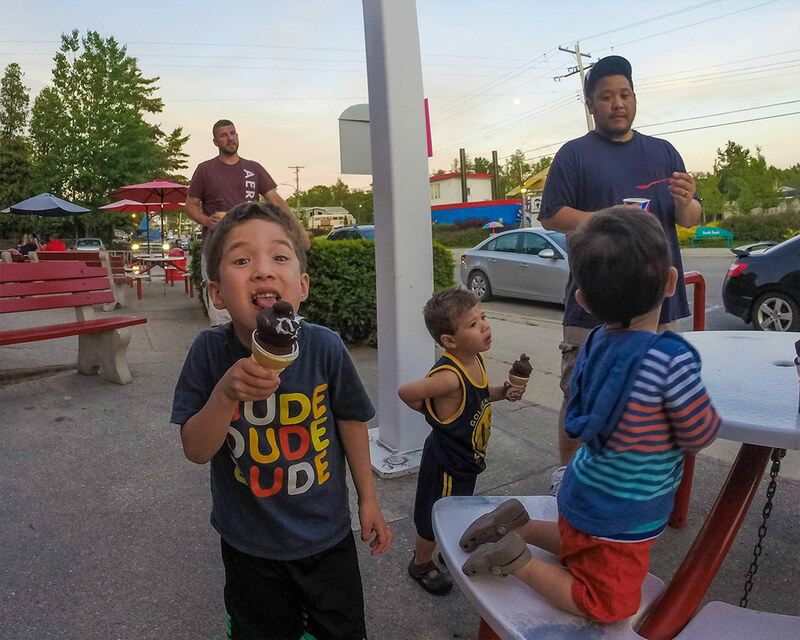 Oh, and of course, there is also ice cream! 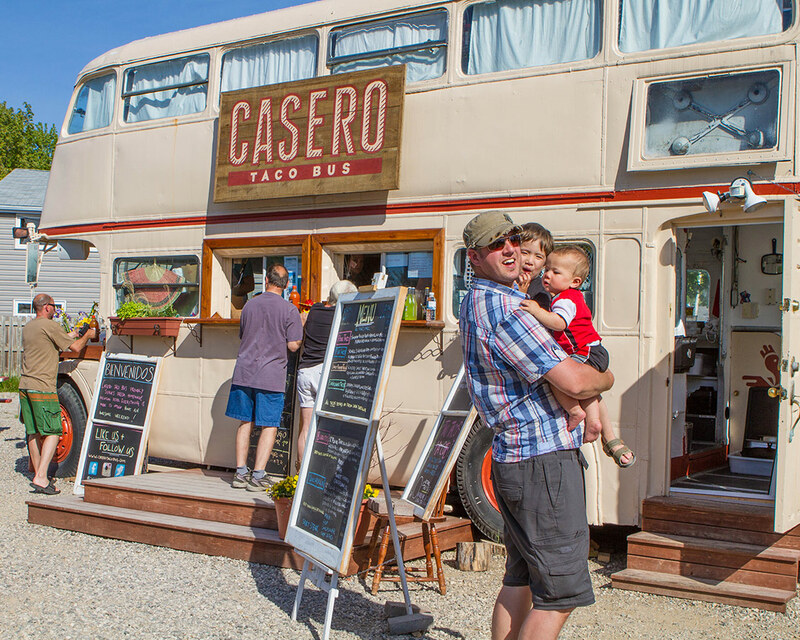 he flavorful Mexican fare is served from a double-decker van turned kitchen on wheels. The food is fresh and the homemade guacamole is definitely worth leaving the beach for. There is limited seating with a few picnic tables on the property. There are several accommodation choices at Sauble Beach depending on your budget. In town, there are inns, motels, and cottages for rent. There are also several cottages on the beach that are for rent. This is normally what we do as it means the beach is only a few minutes away and we don’t have to worry about parking. 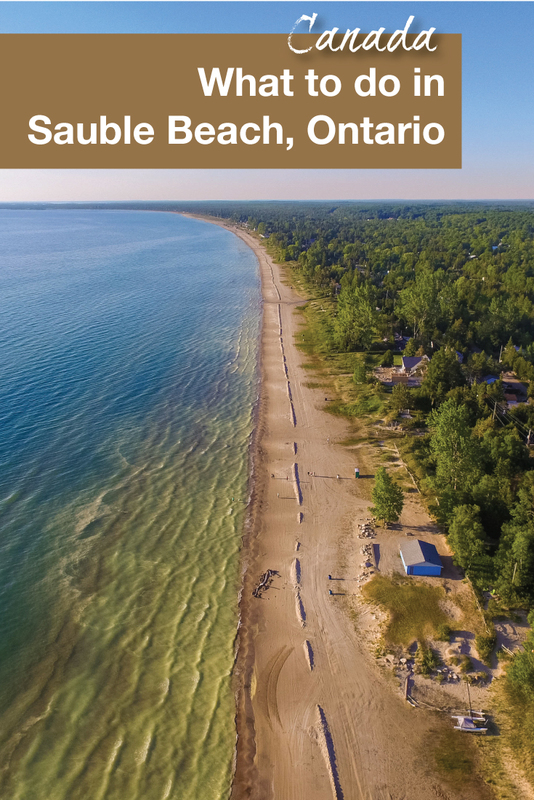 Unfortunately, overnight camping is not allowed at Sauble Beach, but it is allowed at nearby Sauble Falls Provincial Park. Just outside of the town of Sauble Beach is Sauble Falls, Provincial Park. When looking for what to do in Sauble Beach Ontario, this spot should definitely be on your radar. 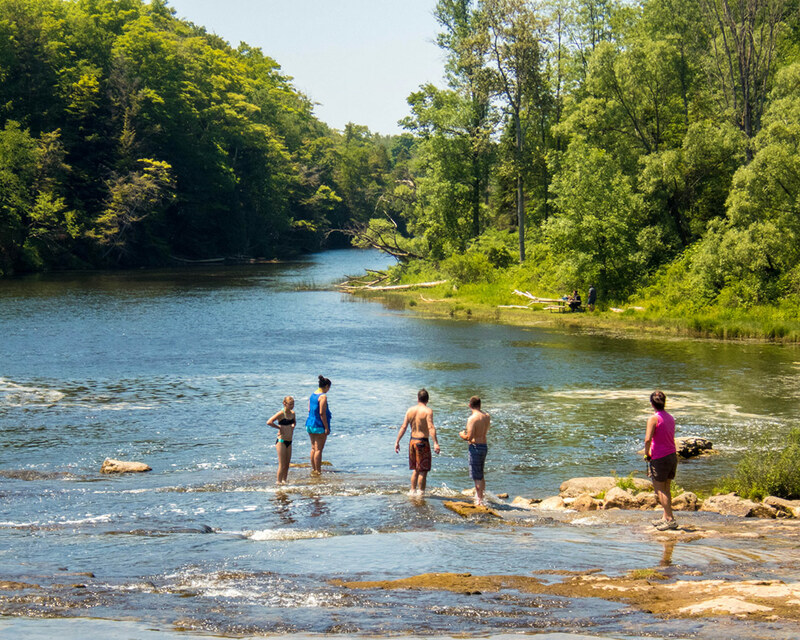 The park is one of the best day trips in Bruce-Grey county if you can manage to tear yourself away from the beach for a few hours. The falls used to power a timber mill and generating station. 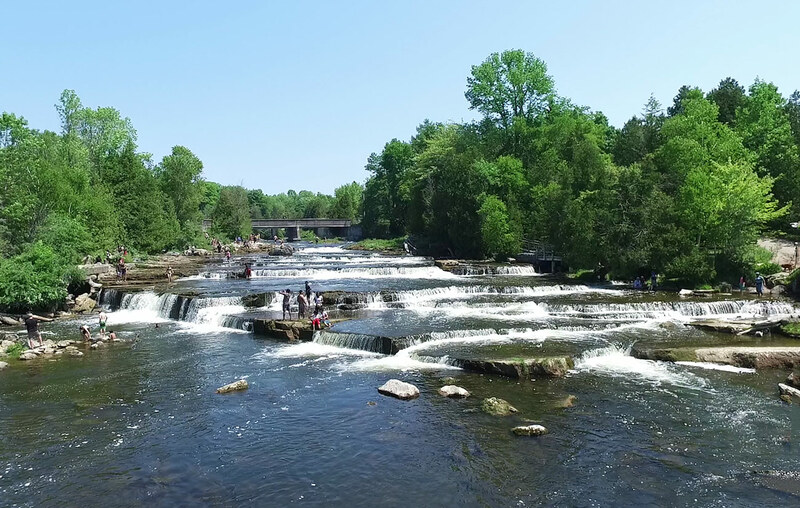 Today, Sauble Falls makes for a fantastic place to splash in the shallow waters and sit under the series of small falls that cascade among the surrounding young forest. Also, Sauble Falls has great picnicking areas, a short 2.5km hiking trail and in the spring and fall, feature Chinook and Salmon runs. Fishing is not allowed at the Falls itself. But, a spot adjacent to the park allows for angling during the fishing season. Additionally, the shores of the river make for the boy’s favorite spots to meet the local wildlife. Although we have not yet done it, another way to experience Sauble Falls Provincial Park is by canoe with rentals on site. We have canoed at several other Ontario Provincial Parks, including Bon Echo and Killarney. Canoeing with kids is an amazing way to explore Ontario parks. So, we are definitely going to tick canoeing of our what to do in Sauble Beach Ontario list this year! Nice post, sounds like a great beach to visit with kids. I’d love to take my nephews! I see the Great Lakes tradition of heading “to the lake” or “up north” is alive and well in Ontario! We usually head to beaches/lakes in Michigan, on Lake Michigan. I’ve not been to any on Lake Huron, though. Sauble Beach in summer looks like an awesome place for the whole family! It looks like a perfect place to spend time as a family. It is just beautiful! This sounds wonderful! I’ve not explored any of Ontario but love Canada for family holidays so I know we would have a great time here. This looks like a perfect family weekend getaway. The beach looks amazing and the waterfalls and tide pools look like they will keep the kids entertained for hours! I have always linked Canada to beautiful mountains and parks so I was surprised to find a beach post in Canada, lol. Cool that everyone can have its little space on sauble beach, crowded beaches are very annoying! Looks beautiful and like a really fun day. One question…is it cold? Ha. Great question 🙂 The weather certainly isn’t (in the summer). The water starts to warm up in June and by July it’s very nice. It starts to cool down around September. This falls looks a great place to hang out, do the hiking and try to catch some salmon(my favorite fish)!! Need to head to America soon. I love that you don’t only experience beach here but you can have this fantastic falls too. I am more fascinated by the waterfall. It’s extraordinary and I’d like to experience here someday. Thanks for sharing. This place is much more than the beach! 🙂 I love all other things that you can do in this place aside from dipping yourself into the waters. Yay! It’s nice that even though this beach has become known to many, it still offers a serene spot for soloists. Beach never fails! Never heard of Suable Beach before. When I think of Ontario, beaches aren’t the first thing that comes to mind, but it looks like everyone had fun. Especially with the super soakers! “Funland at the Beach” is a Dead Kennedys song! Sauble Beach is such a gorgeous area of Ontario. We only visited rarely growing up in SW Ontario, but they were memorable times. Lovely photos! Wow, this truly a perfect summer gateway and sauble beach is likely not that crowded. I like how pristine the water is and full of life. I wouldn’t mind drenching my body for how many hours. It is also great, since there is a waterfall that also situated near the beach. Thank you so much for sharing! I grew up in Thunder Bay, Ontario and my husband just outside of Toronto. I love the summers in Ontario spending weekends at the beach. I have yet to hear of Sauble Beach though. It looks beautiful with its sandy beaches and blue waters. The Sauble beach spread over 11 km! Wow, actually it is quite long. So one can easily spot the idle areas to sit, swim, play and relax. I am sure it will be a great day out for Kids.The falls too looks quite fascinating. Awesome! Looks like such a great place to bring the kids for the weekends. ??? We can’t wait to explore Ontario some day! It looks like the perfect holiday spot for families. Plus, you can never go wrong with Taco trucks! 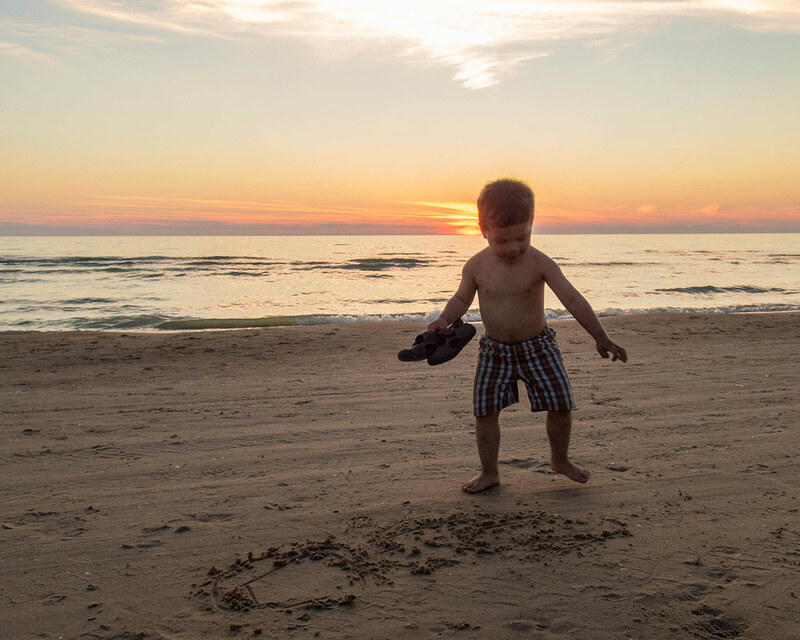 Sauble Beach is amazing… don’t miss the sunsets! I am lucky to have grown up in Bruce County. Check out “Explore the Bruce”… you won’t be disappointed. We do it every year with the kids, making new incredible memories every time. Try running up the sand dunes just down Lakeshore (some are incredibly huge and give you a good workout getting to the top, and a lot of fun on the way back down). See you there! The sand dunes are a blast! We’ll be hitting them this year again 🙂 Bruce is one of Ontario’s true gems, and worthy of many return visits. Wow! this is gorgeous. I’d never have thought it was a beach on a lake. It’s just so massive. How beautiful Christina. I never think of Canada and beaches. Especially the 2nd longest freshwater beach on earth. But seeing the pristine nature of the place I get why it’s the Wagar’s go-to summer spot 😉 Fabulous images as always guys!